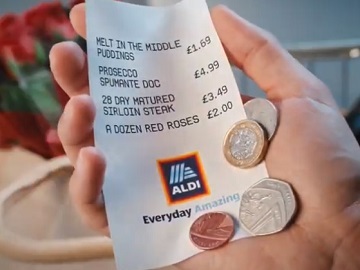 Aldi UK promotes its Valentine’s Day deals in a new advert, encouraging viewers to visit the chain’s website and be inspired this Valentine’s Day. “Here’s a proposal. If you were to go right back, rewind over that Melt in the Middle Chocolate Pudding, that delicious creamy fizz that you found, and that unforgettable sirloin steak enough for two. You’ll find it all started in a romantic place that means so much to you, aisle two at Aldi, where amazing begins,” the voiceover says on the 30-second spot, which features some of the supermarket chain’s offering for Valentine’s Day, including Melt in the Middle Puddings (£1.69/2*100g), Castellore Prosecco Spumante DOC (4.99/75cl bottle), and 28-day Matured Sirloin Steak (3.49/227g). Customers will also have the chance to get, starting from February 11th, Valentine’s Day fresh flowers from as little as £2, as well as preserved rose gift boxes, featuring 12 radiant red roses, beautifully presented in a classic-style gift box with a black satin handle, priced at 49.99 each. The supermarket chain also offers a range of gifts, from balloons, perfumes, candles, and pyjamas to cuddly toys for him and her.